SR is a special Physical Layer message for UE to ask Network to send UL Grant (DCI Format 0) so that UE can transmit PUSCH. Putting it other way, SR is an Uplink Physical Layer message from UE to Network, saying "I have some data to send to you. Would you send me some Grant (DCI 0) for me to send the data ?". How UE send SR message ? UE send it on a PUCCH (or on UCI part on PUSCH). Not all PUCCH format can carry the SR. Some PUCCH format can carry SR and some other don't. UE is using a certain PUCCH format depending on situations to send SR. (For the detailed PUCCH format that can carry SR, refer to PUCCH format page). Another implication of SR being a physical layer message imply that you would not be able to decode this with RRC/NAS ASN decoder. Many of eNB or test equipment would let you convert its log into wireshark file, but it is highly likely that you would not see the SR message in the wireshark unless the equipment vendor provide specific wireshark delimiter. Usually those equipment vendor provide their own log viewer that enables this kind of lower layer message. Who is controlling this SR process ? Once SR is transmitted and eNB recieves it, eNB should send UL Grant(DCI 0) and UE has to send PUSCH in response to the UL Grant. The timing among SR, UL Grant, PUSCH varies on whether it is FDD or TDD. For FDD, refer to Non-Persistant Scheduling for PUSCH transmission. 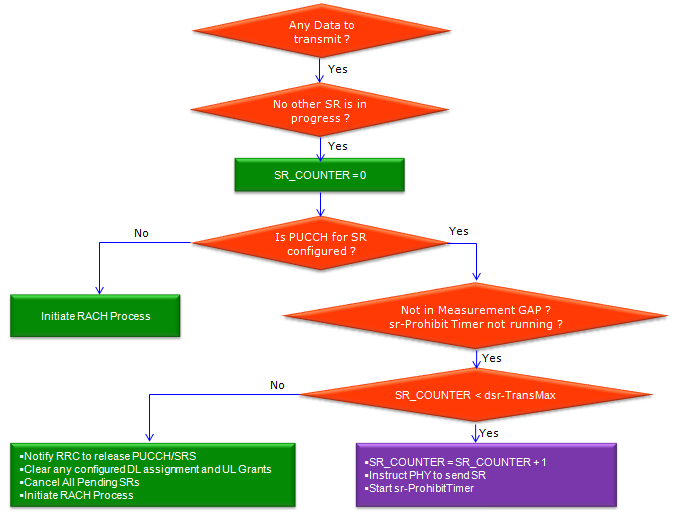 sr-PUCCH-ResourceIndex : PUCCH Resource Location described in 36.213 10.1.5 Scheduling Request (SR) procedure. sr-ConfigIndex : This IE is used to determine the subframe where SR shall be transmitted based on following table and formula. UE can transmit SR at there subframe where following condition is met.